RBTH presents a selection of views from leading Russian media on international events, featuring reports on the drafting of a bill on the seizure of foreign state assets on Russian territory, the closure of a channel for smuggling contraband weapons from the EU and Ukraine, and the suspension of the second Power of Siberia gas contract with China. 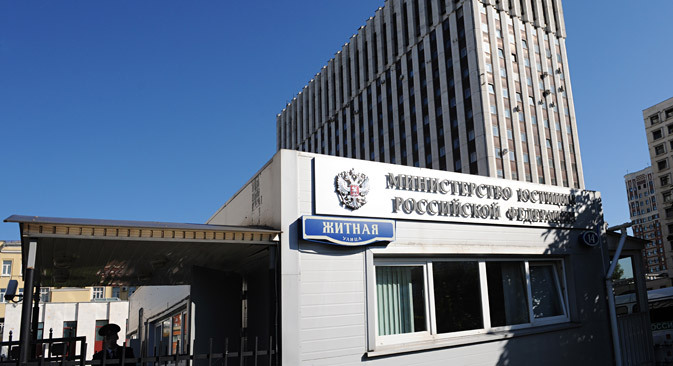 The Kommersant business daily writes that the Russian Justice Ministry has developed a bill according to which any state’s property in Russia can be seized in proportion to the volume of Russian assets frozen in that country. For now the bill has been approved by a dedicated government committee. "The number of lawsuits against Russia in foreign courts is steadily rising," says the Justice Ministry, "and no one is asking Russia to agree to participate." The ministry remarks that in several countries Russian property has "limited juridical immunity," which is why a special law is needed to guarantee a "balance" on the basis of the "reciprocity principle." "Currently, it is possible to seize foreign government assets when there is a court order," said Dmitry Matveyev, executive partner of the Dmitry Matveyev & Partners Law Firm. He does not see the special law as necessary, but notes that if the law is passed, it will not contradict international law. "Any court or arbitration institute can ‘deprive’ a foreign government of immunity if it is guided by the applicable law," said Marat Davletbayev, partner from the Nektorov, Saveliev and Partners Law Firm. But Davletbayev also warns that the court of the country whose property was deprived of immunity can refuse to recognize and implement the decision of the Russian court. The Gazeta.ru online newspaper reports that the Russian Federal Security Service (FSB) has closed a channel via which weapons from the EU and Ukraine were illegally being smuggled into Russia. A large criminal group was apprehended, although the service does not say which EU countries are involved. A total of more than 150 units of firearms were confiscated, weapons that had been made in Russia and abroad. According to Russian Deputy Prosecutor General Ivan Sydoruk, the growth of contraband is due to insufficient coordinating work and a lack of search activity. However, retired FSB officer Alexander Belyayev believes that the growth of supplies of illegal weapons is directly related to the Ukrainian crisis. These supplies had always existed, said Belyayev, "it's only that when the government in Ukraine changed that weapons dealers, like drug dealers, were able to really develop their trade." He claimed that Right Sector (a right-wing Ukrainian nationalist organization that is banned in Russia) controls entire segments of the border. The Vedomosti daily business newspaper cites two federal officials as saying that the signing of the gas supply contract with China via the Altai pipeline (also known as Power of Siberia 2) is being postponed for an indefinite period. The growth of the Chinese economy is slowing down and China is reviewing its energy balance, explain the officials. The demand for gas in China is decreasing. Combined with the fall in oil prices, this means it is now more advantageous for China to buy LNG from Australia, for example, said Valery Nesterov, an analyst from Sberbank CIB. According to BP, in 2012-2013 the consumption of gas in China grew by 12-13 percent and in 2014 by 8.5 percent. In the first six months of 2015 consumption grew by only two percent, remarks Nesterov. In such a situation Russia’s gas giant Gazprom will not be able to receive a high price for the Altai gas. Gazprom is offering CNPC a high price, justifying it with the high costs of constructing the Altai route, but China is ready to construct the pipeline at a lower cost and declare an open tender so that the price becomes transparent, explains Sergei Sanakoyev, president of the Russian-Chinese Analytical Center. The newspaper reminds its readers that a similar situation arose during the talks on the Power of Siberia pipeline. The contract was a political decision – it was signed only after the talks between the heads of state. One of Vedomosti's sources believes that political intervention will probably also be necessary in the second contract.